Alumnae Theatre Company announces our first production of the 2015-2106 season: Antigone, by Jean Anouilh, translated Lewis Galantière. This modernized version of Sophocles’ classic Greek tragedy explores the disturbing moral dilemmas of our times. 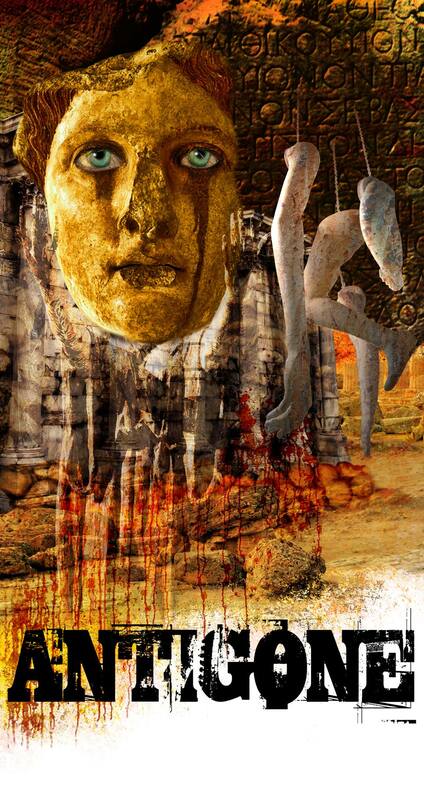 Director Janet Kish evokes a metaphysical Thebes in a parallel universe where the “here and now” is also the “there and then.” In collaboration with the actors, the work also incorporates movement choreographed by Jane Deluzio, and masks sculpted by visual artist and scenographer Teodoro Dragonieri. Special events are planned for opening weekend, September 18-20. View our Antigone–themed art installation created by renowned multi-discipline artist Teodoro Dragonieri in collaboration with Sara Ahmadieh Rad. Meet the actors and production team after the show on in the lobby. Refreshments will be served. Cash bar. If you sit in the last three rows of the audience, you can text, tweet and send messages during the performance. You read that right. Yes, DURING the show! Just NO flash photography, please. Join us from noon-1pm for a pre-matinee panel discussion with six “Antigones” of today: ordinary women who have exhibited extraordinary courage in our current day and age. The moderated panel will address such topics as mental illness, trangendered realities and living life as an amputee artist. Antigone runs Sept 18 – Oct 3. Please note the Alumnae Theatre’s MainStage is completely wheelchair accessible, including accessible washrooms. Rehearsals for Blood Relations, Alumnae’s next production (Mainstage, January 23 – February 7, 2015) are in full (axe)swing! Here’s a peek into the latest goings-on from director Barbara Larose. We have moved onto the mainstage and are just about to start set construction. It’s an exciting time when all the design ideas start to become “real” and we explore the space of our play. Set Designer Ed Rosing and Master Carpenter Sandy Thorburn are embarking on their busiest time. The cast is amazing and includes three Alumnae Theatre members – Andrea Brown, Kathleen Allamby and Sheila Russell. Rounding out the cast are Marisa King, Thomas Gough, Rob Candy and Steven Burley. They are working hard at the moment getting “off book” and prepping for our Stumblethrough before the holiday break. Recent rehearsals have included an evening of stage combat with movement specialist, Paul Babiak; a wonderful period dance review with our consultant Rick Jones (who is also our Sound Designer), while our fabulous Stage Manager Margot Devlin, tried valiantly to record every, step, hop, kick and turn; and a thrilling Laban and movement workshop for the cast conducted by Alumnae member Ginette Mohr. Several cast members are also busily working away outside rehearsal with our Irish dialogue coach Michael Armstrong. The wonderful Ellen Green is the Assistant Director – she doesn’t let me miss anything and provides so much valued insight and assistance in working with cast and design. As the Director, it seems I need to be several places at one time and Ellen’s assistance makes that possible!! Alumnae design star Margaret Spence, who we are so lucky to have as our Costume Designer, has fitted everyone for their period costumes and the women are all rehearsing in their corsets and rehearsal skirts. On props, we have the indomitable and lovely Razie Brownstone. She is out there right now looking for just the right hatchet for the job, among a myriad of other period props [Ed. 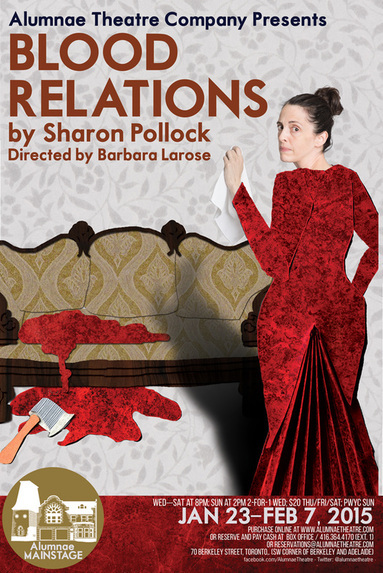 note: Sharon Pollock’s award-winning play is set in 1902 – 10 years after Lizzie Borden’s infamous acquittal for the axe murders of her father and stepmother ]. On December 20, we are conducting a test of some of the material we are using on the set – with Ed and our Lighting Designer, Gabriel Cropley. And I’m looking forward to finding out how the concept will translate and what it will actually look like under the lights! The Producing Team is working behind the scenes making sure everything happens that is supposed to happen and coordinating the activities and expenditures of all the departments. The Team is led by our Executive Producer Brenda Darling and includes Krystyna Hunt, Carina Cojeen and Sandra Burley. Our Marketing Director Chloe Whitehorn is handling the press and marketing materials that will bring in an audience to enjoy the results of our work. Blood Relations opens January 23. Part drama, part mystery, all compelling. You may also e-mail (reservations@alumnaetheatre.com) or phone in (416-364-4170, box 1) your reservations, and pay cash on arrival. Tickets are 2-for-1 on Wed at 8pm; $20 Thu/Fri/Sat at 8pm; Sun at 2pm is PWYC. The Toronto Irish Players rent the Mainstage at Alumnae Theatre for two productions per season. Here’s the audition notice for the first of 2014/15: Bookworms, a comedy by Bernard Farrell. It will be directed by Alan Hunt. SYNOPSIS: In this post-Celtic Tiger Ireland comedy of manners, the bankrupt middle classes cling to the civility of social rituals like to book clubs. Formerly the last bastion of female exclusivity, husbands are invited to participate in a social experiment which goes disastrously wrong. In this satire the surface veneer of normality is penetrated by resentment, adultery, repression and violence. By the end of the evening civility has been tenuously re-established and relationships somewhat restored, but it is unlikely that the men will ever be invited to another meeting of the Bookworms. ANN (playing age 40)-Homemaker. Attractive, insecure, determined, repressed. LARRY (playing age 50)-Builder. Gruff, down-to-earth, pleasant. AISLING (playing age 18) – Student. Spoiled gap-year backpacker. All appearances are via Skype. DOROTHY (playing age 60)-Widow. Refined, nervous and obsessed by Virginia Woolf. ROBERT (playing age 45)-Banker. Alpha male, assured, aggressive. JENNIFER (playing age 30s)-Teacher. Confident, controlling, energetic. VINCENT (playing age 50s)-Recluse. Timid, but with a terrible inner rage. 2. Please forward a recent performance resume & headshot. 3. If the director is not familiar with your work, please prepare a monologue (maximum 2 minutes), preferably comic. 4. Please be prepared to present a cold read from the script. Auditions & Rehearsals will be held at Kimbourne Church, 200 Wolverleigh Boulevard, Toronto (a short walk northeast of the Coxwell subway station at Danforth & Coxwell). Alumnae Theatre Company’s production of The Lady’s Not For Burning, directed by Jane Carnwath, brings the wit, wonder and wisdom of Christopher Fry’s play to life through sight, sound and poetic wordplay – an excellent cast and a beautiful show.